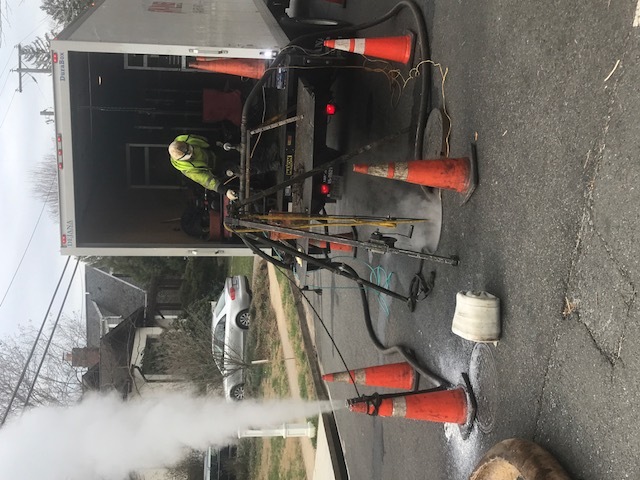 Cleaning and Inspection: Prior to lining the existing sewer, crews clean the pipe using high pressure water hoses and video cameras to inspect the pipe condition. Pipe Lining: Crews place a flexible liner into the existing sewer. Steam or heated water is forced into the liner, pushing the liner tightly against the existing sewer walls. The heat causes the liner material to cure, creating a new pipe within the existing sewer that is free of cracks and holes. Crews then use pumps and hoses to re-route sewer flows, ensuring sanitary service to customers. Reinstating Laterals: Crews cut open the existing lateral pipes serving each home, using a remote operated cutter and video camera. Lateral Connection Sealing: Another contractor may inject grout to completely seal the connection and ensure no infiltration reoccurs. The actual pipe lining process typically takes less than one day to complete. This can depend on the size of the pipe. Allows for pipes to be rehabilitated without disturbing the surrounding neighborhoods and businesses. The process has a 50-year design life. Why Is the County Relining the Sanitary Sewer Line Connected to My Residence? The types of existing pipes that we usually reline in this process are vitrified clay (VCP) and concrete pipes (RCP). Sewer relining is a quick and economical process in lieu of replacing pipes by open excavation. This process prevents major traffic disruptions and health hazards from potential exposure to raw sewage. Assessment of flow conditions within the main sanitary sewer using remote controlled video cameras. Cleaning and inspecting the main sanitary sewer prior and after the sewer lining process is completed. Dye testing to confirm connections between buildings and sewers. On the day of the work, we’ll turn off the water service to the residence between 8:00 a.m.- 8:00 p.m. This is to prevent involuntary sewage backup into your home. 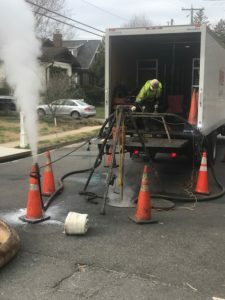 In some cases, the work may have to be performed between 10 p.m.- 5 a.m., usually if the sewer line is located within a business corridor or major arterial street (like Columbia Pike or Washington Boulevard). Residents may also experience loud noise from the equipment, unpleasant odor from the liner and parking restrictions. Depending on the size, the lining process is completed in one to three days. Which Drains Do I Need to Fill Up With Water? How Do I Know If I Have To? Floor drains: Most residential basements have one or more floor drains, usually near the water heater, washer/dryer and A/C unit. Unused bath tubs, showers, sinks, etc. : You may want to pour water in these fixtures because lack of use may have caused the drains to dry out overtime. Sump pump: Found in residential basements, sump pumps have a motor that turns on when the water table is above the foundation of the home. In some cases, older sump pumps are connected to the sanitary sewer system, therefore if your sump pump has not been running for awhile, it is a good idea to pour water into the pit to allow the sump pump to run. Find out more information about sump pumps. If you’re not sure if you have floor drains or a sump pump, contact AM-Liner East’s representative, Olen All 540-955-9671. If you are out of town during this period, make sure your water traps are full. This will help reduce the smell from entering your home. If you believe you smell styrene, open your windows for a few hours to dissipate the smell. Why Can’t I Have an Exact Relining Date? Due to the nature of the work, the schedule is developed about a week prior (a notice is typically sent out before). Crews need to assess, clean and test the pipes before the actual lining takes place which may result in last minute adjustments to the schedule. All directly impacted residents will received a door hanger approximately 48 hours prior to any water shut off. Styrene is a clear, colorless liquid that’s a component of materials used to make thousands of everyday products for home, school, work and play. Styrene is used in everything from food containers and packaging materials to cars, boats, computers, and video games. Derived from petroleum and natural gas by-products, styrene helps create thousands of remarkably strong, flexible and light-weight products, representing a vital part of the U.S. economy and quality of life.The styrene used in these products is manufactured synthetically in petrochemical plants. However, styrene also occurs naturally in the environment and is present in many common foods, such as coffee, strawberries, and cinnamon. For more information on styrene, visit the National Institute of Environmental Health Sciences, Agency for Toxic Substances & Disease Registry (ATSDR) or the Environmental Protection Agency online. Is Styrene Harmful to My Health? There have been varying reports/studies in regards to the potential risks of Styrene at different concentration levels. In general, exposure to Styrene for long periods of time may cause nausea, eye and respiratory irritation, headache, etc. This usually goes away with exposure to fresh air. For more information on styrene, visit the National Institute of Environmental Health Sciences, Agency for Toxic Substances & Disease Registry (ATSDR) or the Environmental Protection Agency online. What Can I do to Reduce My Exposure to Styrene? To prevent Styrene gases from entering your home, pour water into your drains the night before or early morning the day the work is scheduled to be performed. Styrene gases do not remain in the air for long periods of time, so if Styrene gas has entered the residence, we recommend opening all your windows and allow fresh air to circulate inside your home and/or leaving the residence for a few hours. For more information on styrene, visit the National Institute of Environmental Health Sciences, Agency for Toxic Substances & Disease Registry (ATSDR) or the Environmental Protection Agency online. Why do I Smell Styrene in My Home? If you smell Styrene in your home, this could be an indicator of a plumbing issue such as a broken or clogged pipe. You may want to contact a plumber to investigate any potential issues.